HARMAN’s Crown Audio is expanding its DriveCore Install (DCi) Series amplifier range with the introduction of its DCi Network Display 8|600ND and 4|1250ND power amplifiers. 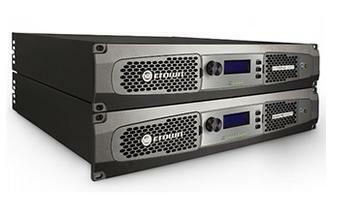 These amplifiers feature front-panel status displays and AVB (Audio Video Bridging) connectivity. The new eight- and four-channel DCi Network Display amplifiers will actually be the first professional audio amplifier to be certified by the AVnu Alliance. Both DCi Network Display amplifiers feature a front-panel display and LEDs and a large multifunction knob and push buttons enable instant access to control functions. The amplifiers are compatible with HARMAN’s HiQnet Audio Architect system setup and control software and utilize TCP/IP-based protocol in HiQnet for network monitoring and control. The eight-channel DCi 8|600ND is spec’d at 600 watts into 8 ohms (300, 600 and 300W into 16, 4 and 2 ohms) and the four-channel DCi 4|1250ND provides 1250W into 8, 4 or 2 ohms (625W into 16 ohms). Both amplifiers offer direct drive “constant voltage” capabilities for 70Vrms and 100Vrms amplification without the need for a step-up transformer, yielding higher audio quality in distributed audio applications with power outputs of 1250W and 600W respectively. Like all Crown DCi Series amplifiers, the DCi 8|600ND and DCi 4|1250ND utilize HARMAN’s proprietary DriveCore (Class D) amplifier IC chip for efficient operation from a compact form factor measuring just 2 RU high. The DriveCore chip combines the amplifier driver stage into the power output stage along with additional audio-signal functions, yet is about the size of a postage stamp. Both amplifiers provide a host of networking and control features including continuous load monitoring, error reporting, pilot tone monitoring and programmable general purpose input/output (GPIO) ports. The DCi 8|600ND and DCi 4|1250ND offer extensive DSP capabilities such as LevelMAX limiters for the inputs and outputs, with thermal limiting, input and output delay, input and output EQ, built-in crossovers and a built-in signal generator.